Biotinylated Human IL-17 RA, Fc Tag (ILA-H82F1) is expressed from human 293 cells (HEK293). It contains AA Leu 33 - Trp 320 (Accession # NP_055154.3). This protein carries a human IgG1 Fc tag at the C-terminus, followed by a Avi tag (Avitag™). The protein has a calculated MW of 61.9 kDa. As a result of glycosylation, the protein migrates as 80-115 kDa under reducing (R) condition, and 150-200 kDa under non-reducing (NR) condition (SDS-PAGE). The biotin to protein ratio is 0.5-1 as determined by the HABA assay. >95% as determined by SDS-PAGE. 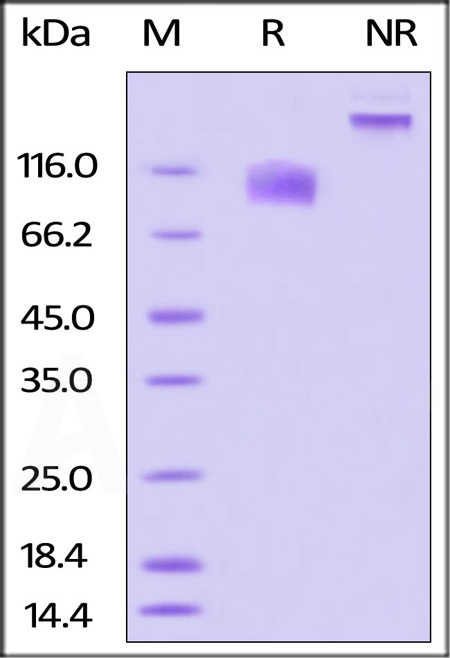 Biotinylated Human IL-17 RA, Fc Tag on SDS-PAGE under reducing (R) and non-reducing (NR) conditions. The gel was stained overnight with Coomassie Blue. The purity of the protein is greater than 95%. Immobilized Human IL-17A, Tag Free (Cat. No. 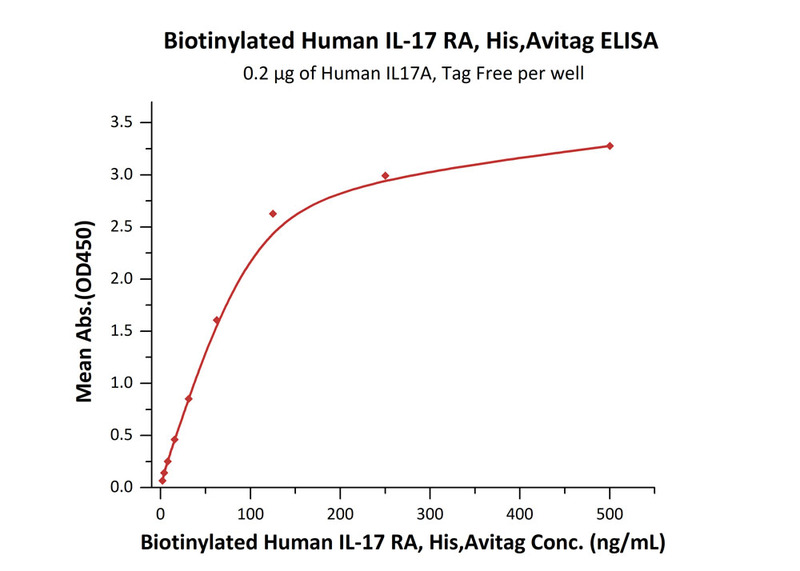 ILA-H5118) at 2 μg/mL (100 μL/well) can bind Biotinylated Human IL-17 RA, Fc Tag (Cat. No. ILA-H82F1) with a linear range of 1.2-9.8 ng/mL (QC tested). Interleukin 17 receptor A (IL17RA) is also known as cluster of differentiation w217 (CDw217), is a pro-inflammatory cytokine secreted by activated T-lymphocytes, belong to ubiquitous type I membrane glycoprotein, and binds with low affinity to interleukin 17A (IL17A). IL 17R mRNA exhibits a broad tissue distribution, and has been detected in virtually all cells and tissues tested . IL 17RA associates with IL 17RC to form a signaling receptor complex for IL 17 and IL 17F . Ligand and IL 17RA ligation promotes T cell activation and the production of IL - 6, G-CSF, SCF, and multiple pro-inflammatory chemokines. Defects in IL17RA are the cause of familial candidiasis type 5 (CANDF5). (1) Puel A., et al., 2011, Science, 332:65-68. (2) Ely L.K., et al., 2009, Nat. Immunol, 10: 1245-1251. (3) Yao Z. et al., 1997, Cytokine, 9 (11): 794-800.